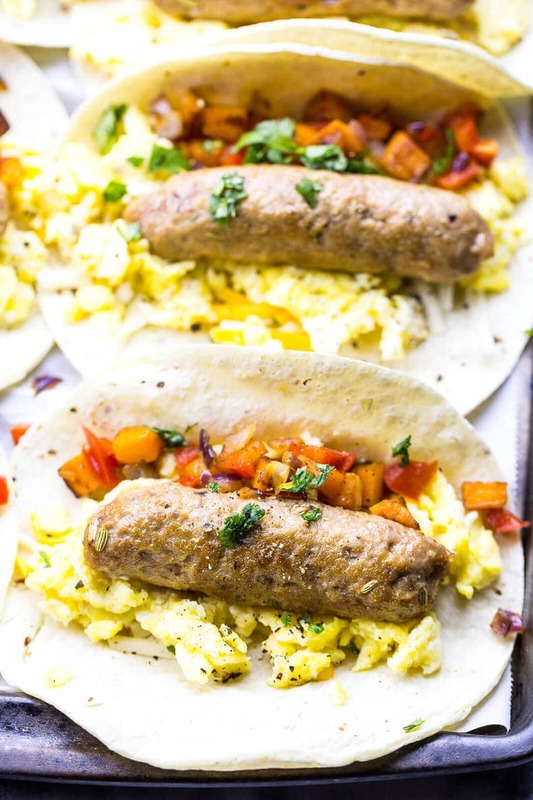 These Freezer-Friendly Meal Prep Breakfast Taquitos are the ultimate make-ahead breakfast for busy mornings, filled with scrambled eggs, sweet potato & homemade turkey sausage. Hi there! Welcome to 2017. 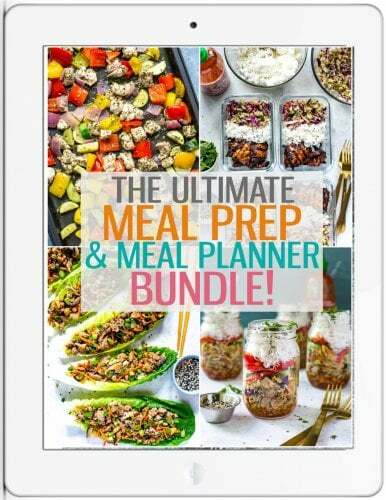 Aka, the year I make ALL the meal prep look SUPER delicious. Yes, I am more confident than usual, because these lil' breakfast taquitos have literally been my savior all week.?? What are taquitos exactly? I'm not really sure. I just stuffed some homemade turkey sausage (easier to make than you think – plus you can freeze it and prep it ahead of time?) into some corn tortillas along with some scrambled eggs, cheese, sweet potatoes, red onions, cilantro and diced bell peppers. The flavours are seriously out of control. 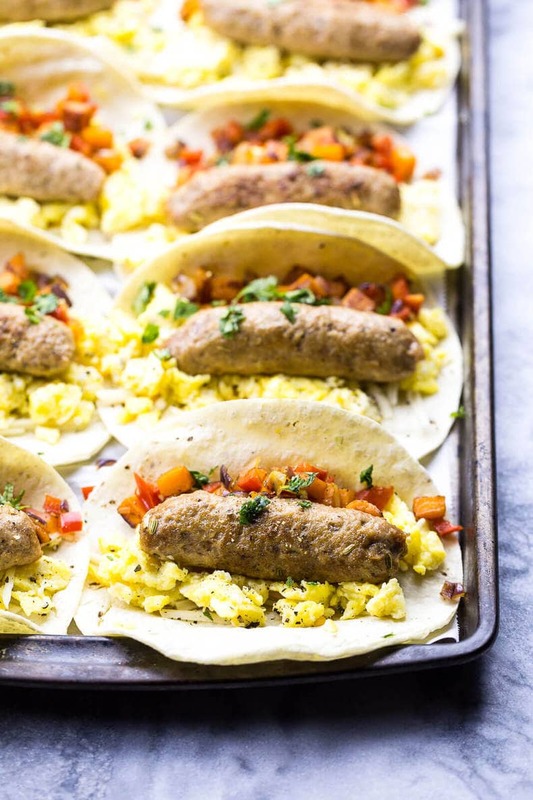 And Freezer-Friendly Meal Prep Breakfast Taquitos sure beat your ordinary bowl of cereal or your on-the-go smoothie. I need some savoury ish in my life, especially in the morning! Soooooo I just got back from a doctor's appointment and I'm a little late getting this post up today because of that. 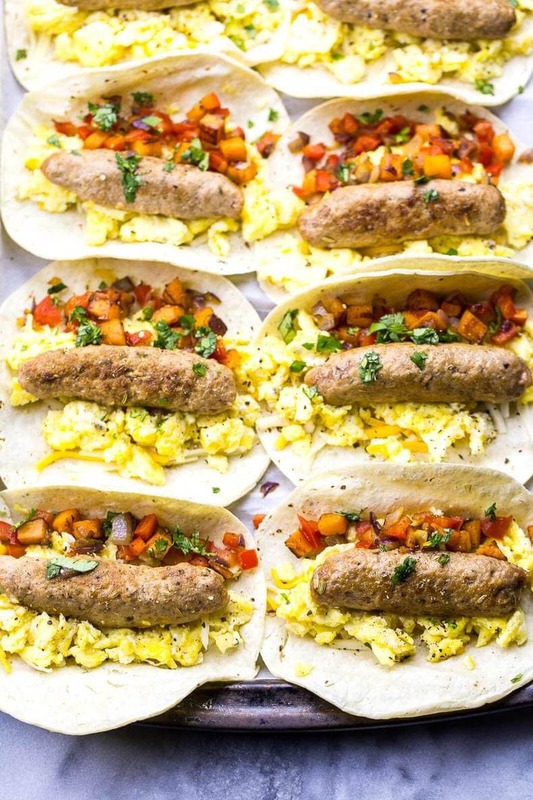 I know, you were totally waiting by the computer, anxiously awaiting for me to post about these Freezer-Friendly Meal Prep Breakfast Taquitos. ?? This is seriously where having a portable breakfast option is super convenient. I literally laid in bed checking Facebook right up until about 10 or 15 minutes before I had to leave, then was scrambling around like a mad person trying to get my stuff together to go. Did I mention I'm not exactly a morning person? Toothbrush in mouth, messy bun on the top of my head, and my clothes barely on, I rush downstairs and open up the freezer this morning at like 7:15am. I should mention that because I work from home, I am *never* up this early. I mean, I still wake up about 7:30 in the morning, but I lay in bed for about half an hour checking email and reading news articles on Facebook, then leisurely stroll downstairs to make my coffee and I'm usually starting work between 8 and 8:30. Everything is quiet, I'm in my happy place, and I don't have to rush around. I eat breakfast later on as I get hungry, and I generally do what I want throughout the day. Which does involve a lot of work to be fair. But still. Okay, we got off topic a bit LOL. The point I'm trying to make is that when I opened the freezer this morning before the doctor's, I discovered that Taylor in the past tense had Taylor in the present tense's back. ?? I take out the Breakfast Taquitos from the freezer, I microwave for 3 minutes, then I spit out my toothpaste, grab my coffee traveller mug and my breakfast and it's off to the races. I've got a hot, cutlery-free breakfast with no effort and it made my busy, hectic morning that much more manageable. Isn't that how breakfast is supposed to work??? 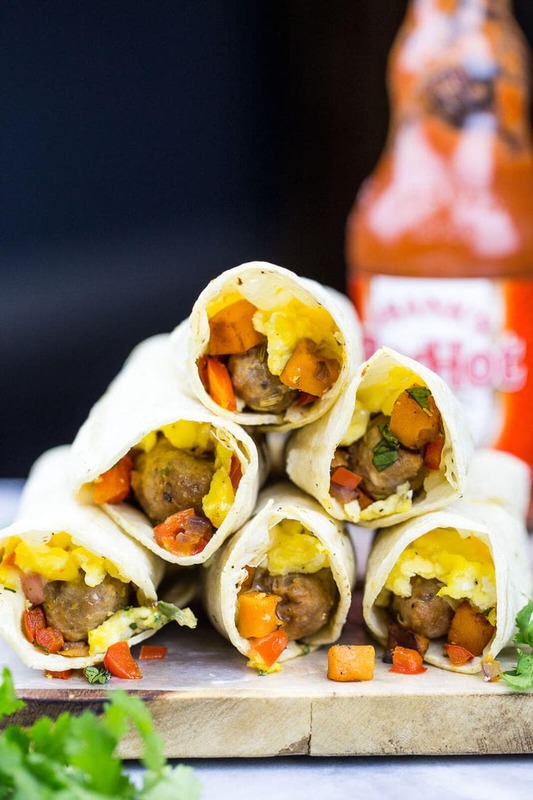 So now I NEED to know if you'll be making these Freezer-Friendly Breakfast Taquitos. And I'd love to hear from you in terms of what your on-the-go breakfasts are as well. I'm toying with the idea of coming up with a sundried tomato and egg white wrap ala Starbucks in the near future too. I love those things. Reach out to me on Instagram, Twitter, Facebook or in the comments – seriously, I'd love to hear from you!? 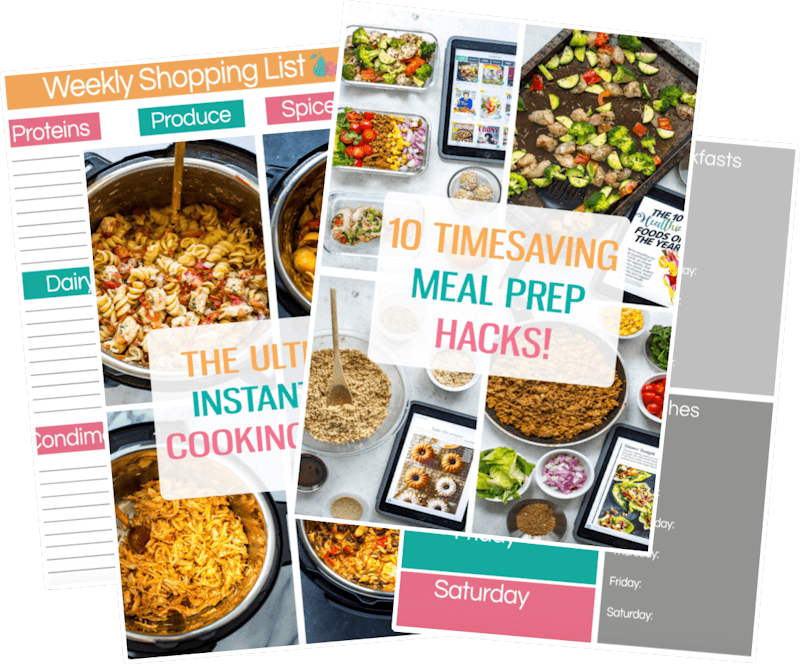 Grab some Glass meal prep bowls if you plan on packing these taquitos up for lunch! And of course I get all my free-range poultry from Butcher Box! In a large bowl, combine ingredients for turkey sausage. Roll meat out into 20 thin, long sausges. Fry in large pan with 1 tbsp olive oil over med-high heat for 10-15 min, flipping sausages often. They can be frozen ahead of time or used for other purposes. Meanwhile, heat 1 tbsp olive oil in same skillet on med-high heat. Saute sweet potato with a pinch of salt for 10 min. Add in peppers and onions, sauteing for another 3-4 min. Remove from heat and transfer to a large bowl. Wipe pan clean with paper towel. Mix eggs together in a large bowl, then heat 1 tbsp olive oil in same pan as was previously used for veggies and sausage over med-low heat. Add eggs and cook scrambled, about 5-6 min. Preheat oven to 350 F. Assemble corn tortillas on two baking sheets. 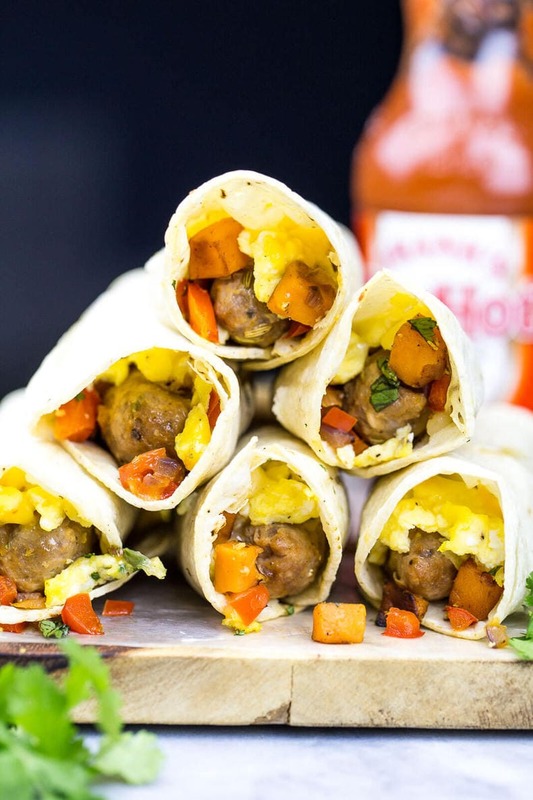 Add a little bit of cheese, scrambled eggs, one turkey sausage, a little bit of veggie mixture and some fresh cilantro to each tortilla, then roll up into a mini wrap. Place open side face down on baking sheet. Repeat until all taquitos are prepared. Bake for 10 min in the oven. Remove, let cool, then wrap each taquito in plastic wrap before freezing. They will also last in the fridge for about a week. Reheat three at a time as a serving, microwaving for 3 minutes to 3 minutes and 30 seconds if frozen in the microwave (more like 1-2 min if refridgerated only). Enjoy! These taquitos are delicious! The sweet potato is a lovely addition. I will say with the chopping, mixing, and cooking, it took me probably twice as long as the 40 minute estimation. Perhaps I’ll chop or mix in advance next time, then follow the rest of the instructions. Also, the corn tortillas I bought began to rip as I rolled. So I’ll have to experiment with a better tortilla or might try the flour/corn mix at HEB. We reheated our in a small toaster oven to keep it crisp. Thanks for the recipe! Looking to try these this weekend! Cold tortillas always rip, place them in the microwave for 10-15 seconds. If they are warm they tend to stretch a bit instead of rip. Only drawback is you can only heat 2 at a time or they all stick together! Hi Stephanie! I just updated it here for you 🙂 Some of my older recipes like this one are missing nutrition info since I only recently started including it! If you have two of these taquitos, you’re looking at 391 calories & 30g of protein! How long do you keep these in the freezer before eating? Hi! These look yummy and seem to satisfy my various family members diet restrictions (GF, dairy free, etc.). So I am excited to make a big batch! I have one area where I am confused though- is the turkey sausage the only part that is freezer friendly? 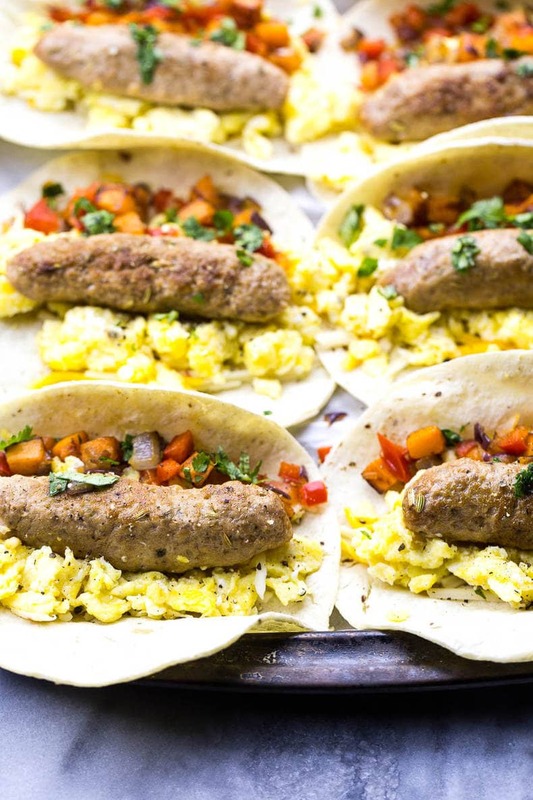 Or can the turkey and eggs wrapped in a corn tortilla be frozen? I’m assuming the various toppings are all added when serving. Also, if doing weekly prep and not freezing, do you think they would last about 4 days in the fridge assembled (sans toppings)? Lol- please disregard my last comment. I just read step 5 which answers all of my questions! Anyway, thank you for this idea and recipe! I think it’s going to be a good fit for my family.